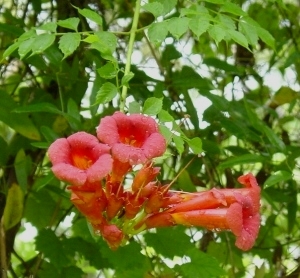 The red trumpet vine (campsis radicans), also known as 'Trumpet Creeper', is an ornamental deciduous climbing shrub, native to the southeastern US. It will do well in zones 5 to 9. For best flowering, trumpet vines enjoy full sun in the northern part of their growing area (partial sun in the deep south), but will also adapt well and bloom in part shade. This photo was taken in mid-summer. The plant is one of several growing in an area of our back yard in Florida where there is a stand of live oak and other trees. The vines grow high up into the trees and are literally covered with bloom which adds a tropical touch to our little 'woods'. Trumpet vines will tolerate average soil, but prefer rich loamy soil a little on the acid side and kept reasonably moist. The plants are primarily grown as climbers. They can also be used as ground cover or as a shrub if kept in check by pruning regularly. To encourage branching and lush fullness, cut back long lateral growth to two or three nodes in the fall after leaves have dropped, or before growth begins in spring. Plants are easily propagated from seed, soft or hardwood cuttings. They will often send out suckers from the roots on the ground which may be dug and transplanted elsewhere. Red trumpet vines are very fast, sturdy growers and can reach a height of 40 feet or more, using their aerial roots to tightly adhere to most any surface. You will want to be selective where you plant them, as these roots can become quite strong and woody with age. The foliage is an attractive, lush bright green which serves very well to hide fences and other unsightly objects that don't require painting or other maintenance. Flowers are displayed in showy clusters on the tips of the laterals and will continue to produce abundant bloom throughout the summer and into fall which attracts hordes of hummingbirds from miles around. The large individual blossom is tubular in shape and measures approximately 3 to 4 inches long. Color varies from shades of nearly white to bright yellow, pale orange to dark red. Trumpet vines have been hybridized extensively to produce plants with superior bloom and a variety of color blends. Campsis radicans 'flava' is an outstanding yellow variety available from many on-line nurseries and makes an excellent fast growing screen covered with large clusters of vivid blossoms that will take your breath away. Since they are mainly vertical growers, you will surely find a spot in your back yard garden for one or more of these beautiful and versatile plants. A word of caution. Trumpet vines are fast and aggressive growers. They will also spread via underground runners. They may become invasive. To contain (especially if you have just a small growing area) prune regularly and pull up runners.